I’m off to my fourth MVP Summit. Sunday starts with a mechanical issue with my plane. After sitting on the tarmac we return to the gate and board another plane. I’ll be lucky if I make my dinner date tonight with Geraldine Gray, Jason Lawrence and Garry Polmateer (my co-presenters for Monday morning’s Partner session). My mood is one of melancholy. The world seems to have lost its mind and it’s taking a toll on me lately. Days earlier President Obama was in my hometown of Dallas speaking at the funeral of fallen Dallas police officers, more police offices were killed today in Baton Rouge and France is still recovering from the massacre in Nice. It’s seems a very somber start to an event that I’m usually over the moon about – but these are different days. The MVP community has undergone a lot of change in the past year. A lot of wonderful new energy and fresh faces, and sadly some old friends have moved on. 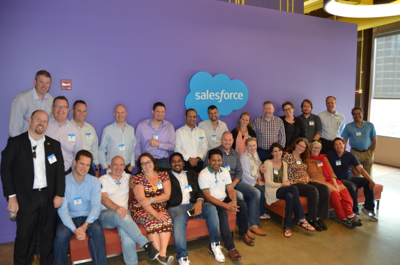 The program continues to evolve with the times – we all know Salesforce never stands still. At the end of the day, whatever awaits me after this long day of travel – I’m grateful. 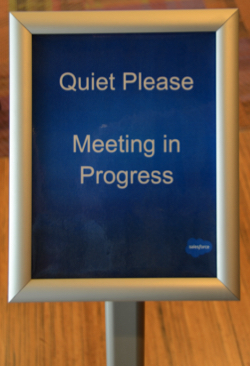 Salesforce is under no obligation to host an event for the MVPs. It has to be budgeted and approved each year and I hope that I do my part to give something valuable back to Salesforce so we’re able to have this experience again next year. In true MVP fashion the night before I hung out with friends at the bar at the hotel until it closed (midnight) and I went to bed. Five hours later I’m up, showered and walking to the Chicago Salesforce office. It’s only a 20-minute walk but drinking hot coffee on a hot and high humidity day I’m already sweating after four blocks – sheesh! From 8am until 12:30 we’re having a bit of a grand experiment. 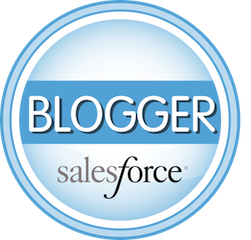 The brainchild of Jason Lawrence of SalesFix, we’re having a "MVP Partner Learn & Share." The objective is to get together MVPs that are in a owner or leadership role in their company (either a Salesforce ISV or SI Partner) and "share the wealth." We covered sales and marketing, delivery, aspects of running your business, and the Salesforce partner program. It’s something that Garry, Geraldine, Jason, and I have done in the past on a smaller scale and we wanted to open the conversation up to our fellow MVPs. Initial feedback from attendees seemed positive and I would not be surprised if we see a repeat event in the future. I appreciate everyone’s candor and contributions to the conversation. 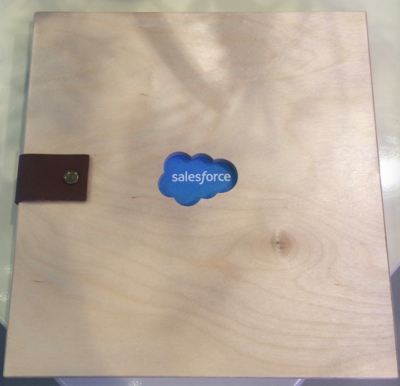 My hope is that everyone walked away with a couple valuable and actionable "nuggets," or at least some affirmation that they were not alone in what they were doing or experiencing as a Salesforce Partner. Lastly after that session, I would like to think everyone found a friend or colleague in the group they could reach out to if they needed to talk about their business. Back at the W Hotel Lakshore, the true "MVP Chicago 16″ event got underway at 3pm sharp. 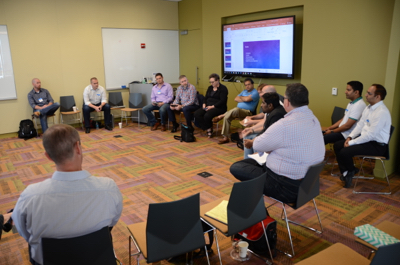 This was a short Day 1 two hour agenda that seemed focused on getting everyone back on the same page as to the state of the community (a discussion led by Erica Kuhl – VP of Community) which included an introduction to her expanding team. Holly Firestone, Manager, Community Programs, discussed the MVP program which I think was helpful with so many new faces in the room. Holly also led us through a discussion of Salesforce Ohana. 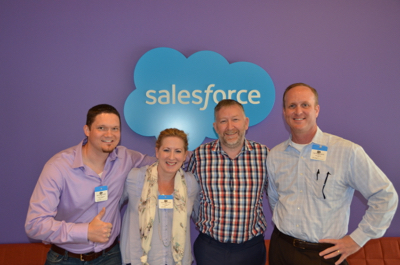 We were also introduced to a new Salesforce employee, Alexander Lovell, Sr. Product Manger, Success Community. The day ended with a pleasant happy hour on the patio of the 6th floor of the W Hotel overlooking the Navy pier. Shawna Wolverton, Senior Vice President of Product Management, kicked off Day two, but Parker Harris, Co-Founder, joined later in the morning. The day was filled with presentations, workshops, and small huddles with product managers (think rounds of speed dating). What did we talk about? Lightning, lightning, lightning – both UX and product roadmap. And being under NDA, that’s all I can say about that. "Whoa! Spicy meatballs in there!" "My all caps swearing went to you? Sorry!" "Shhh – we have to release!" "Turns out people love the words"
"Way to make a big bet"
"We’re not just going to move XXXX forward, we’re going to make it better"
"Don’t get fooled by marketing"